Signature Entertainment have revealed that this October they will be bringing the thriller BAD SAMARITAN to DVD in the UK. Misfits and Mute star Robert Sheehan shines here as the would-be photographer who, along with his partner in crime Carlito Olivero, has a sideline in larceny. Former Doctor Who David Tennant absolutely steals the show, revelling in his role as the sinister, buttoned up Cale Erendreich, a man with plenty of dark secrets who’ll do whatever it takes to keep them that way. From the moment he slides onscreen in his sleek Maserati, to the battle of wills finale, Tennant commands the screen with an infectious, effortless menace. Directed by Dean Devlin, the producer of the INDEPENDENCE DAY films, and written by Brandon Boyce (who scripted the superior Stephen King adaptation Apt Pupil), BAD SAMARITAN is an edge-of-your-seat experience that expertly ramps the tension as we realise Sean is totally out of his depth up against the rich, resourceful and merciless Cale. A slick, shocking, knockout good time, BAD SAMARITAN takes home invasion thrillers THE COLLECTOR and DON’T BREATHE and ramps things through the roof, the way only blockbuster king Devlin could do. Struggling photographer Sean Falco (Sheehan), who funds his lifestyle with a sideline in burglary, thinks he has hit the jackpot when he breaks into the luxurious house of the wealthy Cale Erendreich (Tennant). Things go wrong when Sean discovers a woman chained up in the house. Unable to free her before Cale returns, Sean reluctantly goes to the police to explain what he’s seen. By the time they investigate, Cale has covered his tracks, and the police tell Sean to stop harassing him. Sean soon realises Cale will stop at nothing to shut him up - permanently. 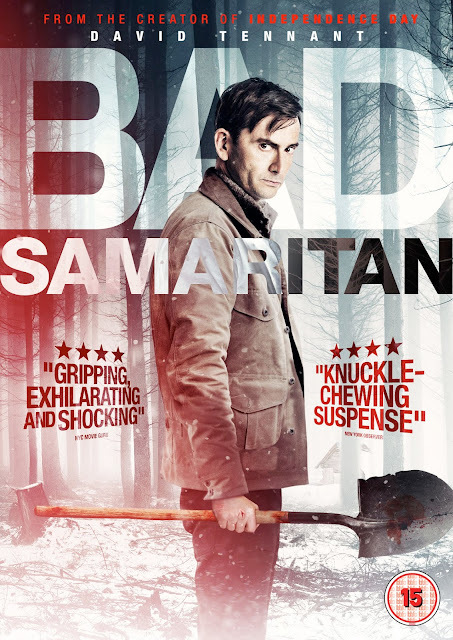 BAD SAMARITAN comes to DVD in the UK on 8th October 2018 courtesy of Signature Entertainment.